Jake from Y5 achieved the amazing result of coming 3rd in the World Maths in Motion Day race last week. 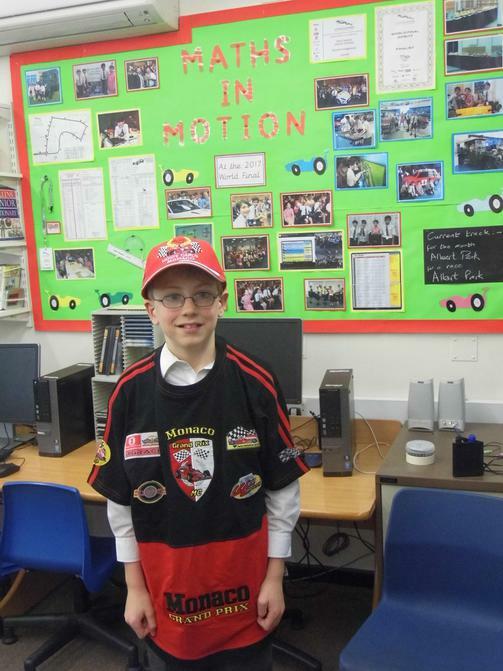 Jake attends our Maths in Motion after school club and has learnt all the skills to prepare his online race car as well as measuring the twists, turns and lengths of Grand Prix race tracks around the world. For this one-off race, he had to prepare a car that would be as fast as possible around just one lap - as well as submitting the details on the actual day of the race. There were 13,000 entrants in the race and Jake did brilliantly to come 3rd. He is pictured in his prize: t-shirt and cap from the Monaco circuit.